Finding our way in a complex system is tricky. Social network maps can provide a way forward, but only if viewed as tools for complicated problems and not as true wayfinding solutions for complex ones. One of the more taken for granted aspects of human life is knowing where you are. You probably have a clear sense of what you’re reading this on (e.g., laptop, mobile device), where you and that device are situated (e.g., home, office, sidewalk cafe), and where that situation is located in the world (e.g., city, state, country). In some of these settings, this could be viewed as a simple issue where there are clear markers, conventions and shared realities that dictate where you are. If I say “I’m at my desk at home” that conveys a very clear sense to those who know me about the physical space I’m in and where that space is located. Online, things are a little more tricky because the locations are not tethered to something physical, only addresses that point to some server that presumably brings to Yahoo!, Google, Wikipedia, BBC News, the Journal of Medical Internet Research, create your own Star Wars movie, or wherever you’re intending to go. As diverse as these sites are, you still have some idea of where you are and where you’re going. The space in all these settings is defined by markers such as addresses, navigation bars, and the limits of the screen you’re using whether it be a 24 inch monitor, an iPad or a handheld phone. This is more complicated. So while I might be visiting the JMIR site, I could be on many of the hundreds of articles published, the author area, the editorial pages or somewhere linking between them. If I have multiple browser windows open, I could actually be at two places at the same time. But in each case, we can deduce through some effort about where I am. Social systems, particularly those with multiple overlapping layers of organization (individuals within teams within organizations within communities) are complex. Understanding where someone is within that system provides only a partial sense of where a person really is. Consider social networks. 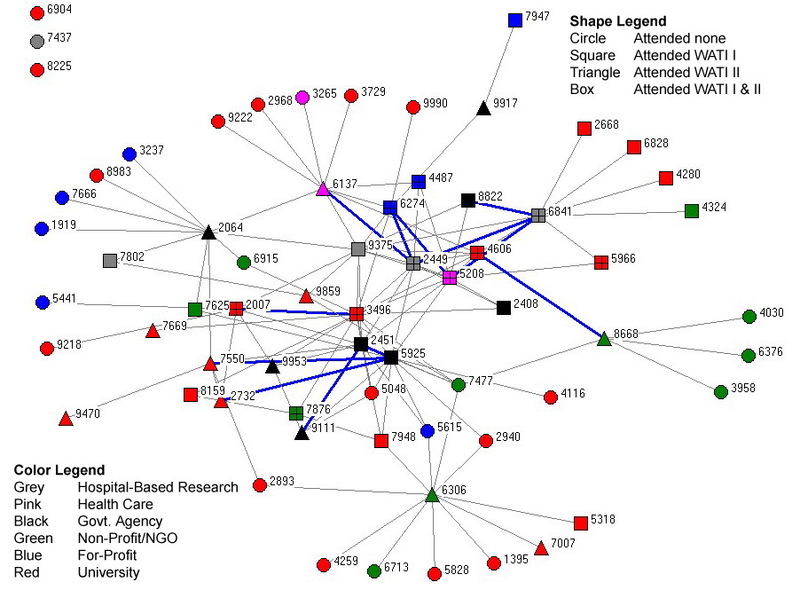 Below is an example of a social network taken from a paper I published in 2006 with Tim Huerta that looked at the Web Assisted Tobacco Intervention community of practice. Social networking maps are very useful for illustrating to people where they might fall within a social cluster, but more importantly, it also shows where others fall in relation to themselves. So while we’re obviously familiar with who we know, we might be less familiar with who knows us, and almost completely ignorant of who those we know are familiar with. These secondary connections are commonly referred to as weak ties, popularized by the work of Mark Granovetter. Often the most powerful changes come from mobilizing these weak ties — in large part because the further away from the starting point you go, the more diverse the elements are that you engage. Engaging diversity, creates conditions for new patterns of behaviour to emerge and thus, innovation, learning and change. For every complex problem there is a solution that is neat, simple…and wrong. Social networks are gaining in popularity. Recent mass-market books by Nicholas Christakis and James Fowler and the newly released book by social network scientist Albert-Laslo Barabasi have (or will) accelerate this. But what is missing from the discussion of social networks is place and theories of taking these complicated visuals and translating them into strategies for navigating complex environments. Maps of social networks are great as a start, but they actually offer little practical advice on where to go or even where you are in terms of knowledge space. Yes, you see where you are relative to others in a graphical representation, but social networks for collaboration are layered with organizational bureaucracy, likes and dislikes, technological and time constraints that are easily forgotten about when one maps out connections on chart or PowerPoint presentation. In other words, social networks are treated as complicated, when really they are complex in the manner in which they are negotiated. Wayfinding is considerably more complex when one considers the reality of trying to navigate through a social network to get something done. Just as design thinking might be viewed as a stance, its value goes beyond seeing things different towards actually producing new things that have value. Likewise, social network maps provide us with a stance for viewing the social landscape differently, but offer little in understanding how to traverse that landscape. For knowledge translation and public health, better wayfinding in complex, rather than complicated systems is the next step in the journey towards navigating a path to health.